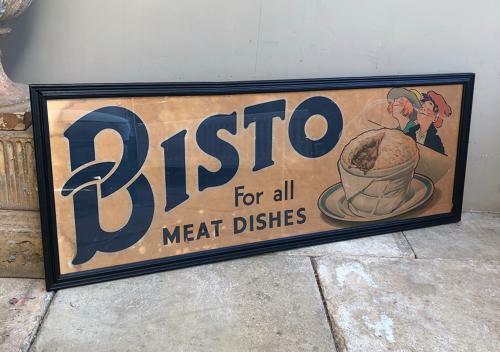 Very rare 1930s Original Shops Advertising Poster for Bisto gravy. A large size and a rare survivor. It has been mounted on board & framed (years ago) & the glass has been recently replaced. You can see if you look close up where it has been folded at some point in its life & there are a few blemishes as expected. Overall excellent antique condition though. There is string to wall hang but personally I would add hooks and fix to the wall as it is a good size and pretty heavy.